Invest in ceiling and floor fans and position them strategically throughout your house. Fans help increase air circulation which, in turn, enhance the performance of your air conditioning system. Now you can raise the temperature on your thermostat, and save a little on your energy bill without increasing the wrath of your heat-sensitive spouse. Many supermarkets offer membership discounts to certain gas stations. Most discounts are designed on a rewards system by accumulating points for every dollar you spend on groceries and prescriptions. Redeem your points at a participating station to receive your gas discount—the higher your point level, the higher your savings. In some cases you can save up to 50 cents per gallon! Do a little research, find a membership discount that works for you and use it to your advantage! Join the coupon revolution! 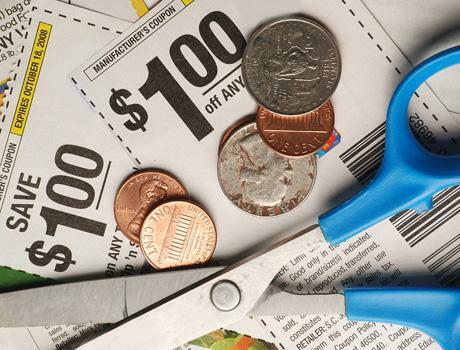 You can save dollars by the dozen by being disciplined and organized enough to seek and find coupons for the goods you buy regularly. The internet is a great resource in your cost-cutting fight. There are many sites and forums dedicated to helping you find great deals on items you already use. Some supermarkets even offer frequent shopper benefits and mail or email you coupons for things you purchase often. Become vigilant about reducing your energy costs. Cooling an empty house is an expense you simply don’t need to carry. Get into the mindset that a few warm minutes when you get home is a small price to pay for a lower electric bill. Gas prices are not likely to drop any time soon. If you can, find someone to ride to work with. Or turn your two-car-household into one simply by dropping and picking your spouse up from work. Such cost-saving behaviors can quickly impact your bank account in a positive way. Finding ways to save your family money each month doesn’t have to be a painful exercise. There are plenty of relatively pain-free ways to save if you’re willing to try.